Free download Active@ File Recovery latest version from direct download link. Active@ File Recovery for Windows provides the ability to effectively recover lost data caused by accidental deletion, disk formatting, virus and other reasons. 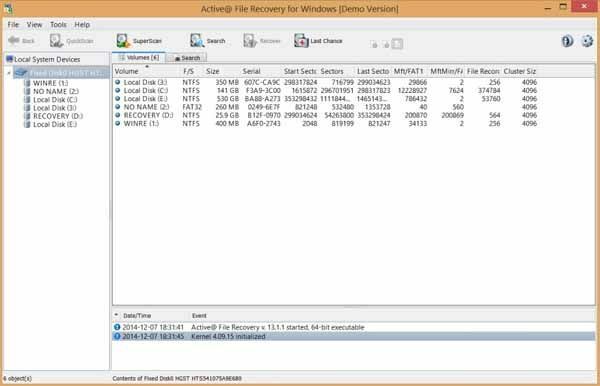 The Enterprise package of Active@ File Recovery also includes a Partition Recovery tool used to recover data from deleted or damaged volumes. The Partition Recovery tool can be launched from the bootable CD to work with a crashed or failing computer system. Active@ File Recovery Enterprise installation package contains a CD/DVD ISO image that you can burn to get a bootable CD or DVD with a lightweight version of Windows 7™ running in RAM (WinPE 3.1). It is the only way to recover your data in case your system is not bootable and you cannot attach the damaged Hard Disk Drive to another machine. The Professional package also includes integrated Active@ Disk Editor (or Hex Viewer – a utility for low-level data inspection), Virtual RAID reconstructor, being able to recover damaged RAID disk arrays, and File Organizer needed to re-organize and rename files detected by their signatures. The Ultimate edition extends the Professional package with Active@ Boot Disk Lite: an ISO image that you can use to create a bootable CD/DVD or USB with a lightweight version of Windows 7™(WinPE 3.1) or Linux (OpenSUSE 13) running in RAM. It is the only way to recover your data when your system is not bootable and you cannot attach the corrupted Hard Disk Drive to another machine. Supplied Linux LiveCD boots the latest UEFI secure boot systems & regular BIOS.